A stunning commemoration of Jews in Poland before the two World Wars, IMAGE BEFORE MY EYES pays homage to the dynamic and vibrant society of 3.5 million people that was destroyed during the Holocaust. Unearthing the stories of Jewish villagers, aristocrats, socialists, Zionists, and artists who fashioned a thriving civilization with a 900-year history, this triumphant films draws on the sacred and rare artifacts of a crushed world-home movies, forgotten song recordings, and the evocative memories of survivors-to recreate Jewish Poland. 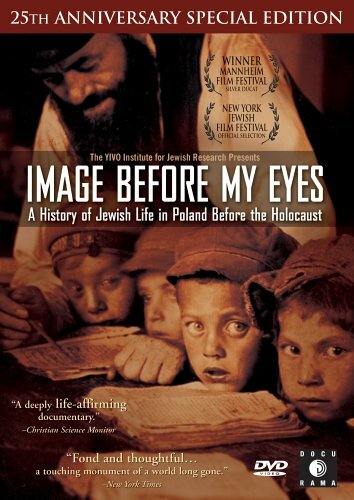 Tracing the subtle contours of Jewish Diaspora, IMAGE BEFORE MY EYES visits people as varied as a former mayor of Scarsdale, New York describing his youthful Polish patriotism and a Brooklyn housewife who touchingly sings the Yiddish songs of teachers, tradesmen, and beggars she learned as a child in Warsaw. From the bucolic, traditional shtetls of the countryside to the freewheeling cultural revolution in the cities led by freethinkers, award-winning director Josh Waletzky (Partisans of Vilna) masterfully memorializes a proud culture that still inspires hope and reverence.